The National Council for Occupational Safety and Health is spearheading several campaigns to protect American workers and their right to a safe and healthy workplace. The number of U.S. workers in temporary help jobs has reached an all-time high – jumping more than 50% since the recession ended four years ago to 2.8 million — the highest number on government records dating to 1990. Major corporations now use staffing as a permanent feature of their business model to meet the demand for flexible labor and lean production and to pass off the responsibilities of being an “employer”. But temporary workers face a tough employment predicament: Many receive insufficient training or are inexperienced with how to protect themselves on the jobsite, but are reluctant to mention that to employers so that they aren’t replaced. Additionally, when compared to standard employees, temporary workers tend to be younger, less educated and disproportionally consist of minority workers, many of whom might be immigrant workers. In November 2013, National COSH, along with the National Staffing Workers Alliance, the Occupational Health & Safety Section of the American Public Health Association, and MassCOSH, provided recommendations to OSHA about how the agency can improve the safety and health of temporary workers. See the recommendations here. In addition, our local COSH groups and other allies are working hard to pass state and local initiatives that would make temporary workers safer on the job. For example, the Massachusetts Temporary Worker Right to Know Law gives temporary workers rights to information about the conditions of their employment and about job safety and health hazards. California’s new temp worker law holds companies that outsource jobs to staffing agencies or other temporary help companies responsible for ensuring compliance with employment laws and labor standards designed to protect workers. A lot of the people you see doing public works project – paving public roads or laying municipal sewer lines, for example – are not public employees. They work instead for contractors, who were hired through a public bid process that rewards the lowest bidder. All too often, these low bidders manage to obtain contracts because they cut corners on safety, putting workers’ lives and health at risk. We believe that contractors’ workplace safety and health programs should be considered during the public bid process and we are working throughout the country to urge state and local public officials to consider bidders’ safety records and programs when they award public contracts through a public bid process. To learn more about this effort and how you can help, contact us by clicking on the email address at the bottom of the page. In the United States, immigrant workers constitute a significant proportion of the workforce. Unfortunately, they also suffer a disproportionate high level of workplace injuries and fatalities. While increased public acknowledgement of this serious and growing problem is an important first step, government agencies must be held accountable to ensure that immigrant workers have meaningful protection under the workplace safety and health laws regardless of immigration status. 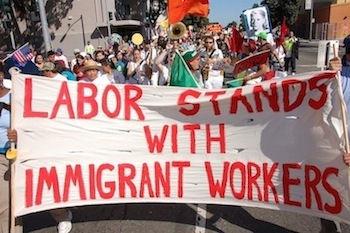 The Immigrant Workers Campaign brings worker advocates together to ensure better workplaces for immigrant populations and ensure government entities are protecting those rights. For some of the most recent recommendations developed by the immigrant worker policy group please click here. Please join our efforts to improve workplace health and safety for immigrant workers! For more information on how you can get involved, contact us by clicking on the email address at the bottom of the page. UPDATE: National COSH calls for comprehensive immigration reform. Read our immigration reform platform here. Workers who report safety and health hazards on the job are supposed to be protected from retaliation under section 11c of the OSH Act. Sadly, the system for protecting “whistleblowers” from retaliation is badly broken and has never effectively functioned to protect workers from retaliation. Several independent government audits have found that very few workers who are fired for reporting hazards ever get their jobs back. At the National COSH we believe that the OSH Act can never truly protect workers if they don’t have a real right to speak up for their health and safety. That’s why we are working on a national campaign to promote real protections for whistleblowers, both through proposed changes to the OSH Act and through changes in the way that local and regional offices handle whistleblower complaints. For more information on how you can get involved, contact us by clicking on the email address at the bottom of the page. Each death on the job is a horrible tragedy, but one that is often preventable. Around the world people came together each year during Workers’ Memorial Week (WMW) to honor fallen workers with vigils, ceremonies, marches, meals, and music. Tales of loss and remembrance echo from community to community – along with a renewed dedication to action. One of the first steps in preventing future fatalities is to understand the causes and circumstances surrounding previous ones. But it is currently difficult to identify the names of workers who have died on the job and any details about their cases, including any investigative findings by US OSHA and/or state agencies. There is no publicly available database that lists all the known cases of workplace fatalities with full information related to those cases. The annual Census of Fatal Occupational Injuries from the Bureau of Labor Statistics contains no identifying data; a running total maintained by OSHA includes names of the deceased, but little other useful information. If you have an interest in joining our Fatality Data Work Group, contact us at coshnatl@gmail.com. Many of our local COSH groups and allies are also active in local and state advocacy campaigns and training programs that advance safety and health protections for workers. For example, our local affiliate MassCOSH initiated a Teens Lead @ Work to provide an empowering environment where teens develop their organizing skills, reach out to other teen workers, and promote safe, healthy work and strong enforcement of the Child Labor Laws. The program builds bridges among native-born, documented and undocumented teens in the fight for young worker rights. Teens Lead @ Work has grown into a national network of peer education programs including MassCOSH, the New York Committee for Occupational Safety and Health (NYCOSH); the Philadelphia Project on Occupational Safety and Health (PhilaPOSH), the Southern California Coalition for Occupational Safety and Health (SoCalCOSH), and Labor Occupational Health Program at the University of California Berkeley (LOHP). For more information visit the MassCOSH website. Western NYCOSH is part of a coalition organizing with dairy farmworkers to fight injustices like wage theft and hazardous working conditions. NYCOSH is working in collaboration with community organizations, workers’ centers, unions, and other advocacy groups to support low-wage and immigrant job seekers in their search for good and dignified work and to urge legislators to reform New York’s employment agency laws. For more information about local campaigns, contact a local COSH group in your area and visit our SpeakUp4SafeWork campaign website.